Get instant victory after destroying the captain. If both players fail to destroy each other’s captain or defenders, then the match will be tie, you will get the extra time. In this extra time, defenders play an important role. Destroy the defender and get the victory. As usual, Orbital 1 game starts with a tutorial in which you learn about the basic of the game; how to play Orbital 1, deploy units, upgrading, couriers, cards, and much more. After the tutorial, the player has to manually take care of all kinds of things; upgrading, managing the deck, and so on. The Basic – In this game, you choose your best units[troops, gadgets] for the battle, deploy them in a strategic way, protect and defend your captain & Defenders, and increase the power of your units by upgrading. The attack style of each unit is different; some units attack from a distance while some units go close to the enemy unit and then start the attack. 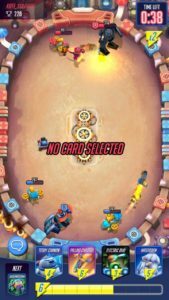 How to unlock new cards? To unlock new cards, earn trophies and jump to the next stadium. To earn trophies, win battles! There are a number of ways to obtain cards; win a challenge, open the couriers or using real-money. To level-up a unit, you need the same unit card. For instance, to upgrade chaser unit, you need chaser cards. The player gets free courier after every four hours. Another way to obtain couriers is by getting the victories in the battles. Don’t forget to wake up them. Use the best combination; include all types of units; air troops, gadgets, attack from a distance/range, with fast movement speed. After building the best deck, it’s time to practice. Play in the practice mode before you try in challenge mode. By playing in practice mode, you will be able to know the weakness of your deck. ⇒ If it goes wrong, do some changes and try again! ⇒ How it works! -> It’s important to know about the units. If you don’t know about the units, then you can not use them in a strategic way. Go to the deck section -> tap on a unit and check its information and other attributes; is this unit fast? Damage? HP? and so on! ⇒ The Two Sides -> Both defenders defends the captain from front & back side. You have to take care of both sides, you can deploy your units either on the front side or back side. Managing both sides is an important task. If the opponent is attacking the front defender, then deploy the unit on the front side and vice versa. ⇒ First Attack? It would be better if you wait for the opponent unit and then deploy yours. Look at your cards, wait for the opponent turn. For instance, if the opponent deploys a ground unit, you can deploy air unit or unit that attacks from a distance. ⇒ Complete the quests to earn couriers. ⇒ Don’t waste your coins in upgrading useless cards. ⇒ Go to the shop section -> scroll down to bottom -> cards -> if there is a good deal available, grab it in exchange for gold coins. ⇒ Level-Up by upgrading the units. Leveling up increases the attributes[HP, damage] of your captain and its companions/defenders. Next Post:Dead Rivals Guide, Tips, And Cheats To Play Like A Pro!